While it’s pretty common to blame corporate greed for everything bad that’s happened in the comic book industry, there have also been cases where it’s led to some artistic highpoints. One of these came in 1953 when Martin Goodman decided to revive his big three superheroes of the 40’s; Captain America, The Human Torch and The Sub-Mariner. Although Goodman obviously thought that the Torch would be the most popular (He was spotlighted on the covers of Young Men #24, the comic that led to the revival) and Captain America is the most remembered today because of the over-the-top anti-communist stance of the stories (Just one of the many EEEEEVILs of Stan Lee’s career that Kirby Kultists like to cite, even though Fighting American was no less jingoistic), the Sub-Mariner ended up becoming the highlight of the revival. Why? 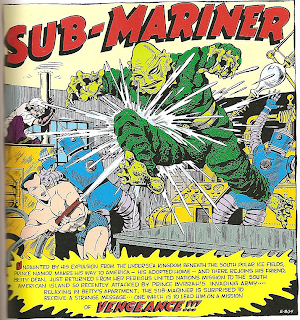 Well, apparently there were plans for a Sub-Mariner TV series, which led to Goodman making sure that Sub-Mariner’s own title stayed afloat (If you’ll pardon the pun) for a longer time than Cap and the Torch’s did. The Cap & Torch revival titles only lasted three issues apiece, while Subby’s lasted a full ten, well after the Comics Code actually. The TV series never came to pass, but oh, what a glorious ten issues those were! 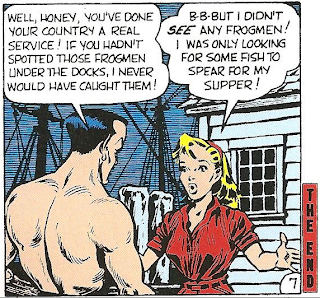 Bill Everett has already been contributing some outstanding art to the Sub-Mariner stories seen in Young Men and Men’s Adventures, but here, with a comic devoted entirely to his own character (except for some back-up features), he had a chance to really cut loose. In some ways, this was the highlight of his entire career. 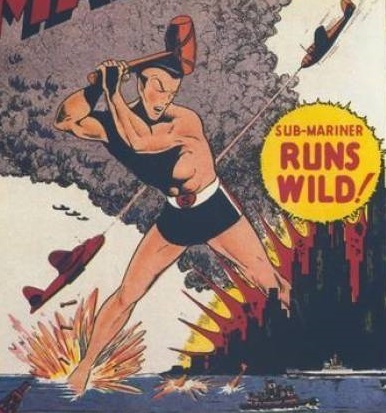 And best of all, since the anthology titles and Cap and Torch stories were already collected in the previous two volumes of Atlas Era Heroes, this volume is nothing but issues of Sub-Mariner’s own title. As Roy Thomas says in the introduction, they really saved the best for last. I love the little touches like the wavy panel borders that make it look like each panel is being depicted through drops of water. I’ve seen Everett do this on some of his non-Sub-Mariner comics during this time period, but here it just fits. But these comics don’t just stand out for the art; Everett makes his mark in the writing as well. It may not be everyone’s definition of good writing (Everett has a real problem with explaining some of his more bizarre plots, although in some cases that enhances their effectiveness), but you wouldn’t mistake these stories for those of any other character on the stands! 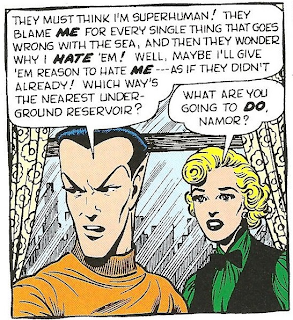 One of the things that stands out is the characterization of Namor himself. I said in my review of Golden Age of Marvel Comics Vol.1 that Namor was treated as more of a straight-up superhero during this era than he was in the past, with only a scant mention of his villainous beginnings. Basically he was like Aquaman, only more badass. However, while that may have been true at first, Everett was always a wild-card, and he wouldn’t keep his hero tame for long. Everett once told Roy Thomas that he looked back at his early Sub-Mariner work and said that he found it lacked depth and was just the venting of an angry young man. While one can definitely see why he’d think that about the earliest Sub-Mariner stories, the sense that he was venting was also apparent here as well (Even though things are far more polished). 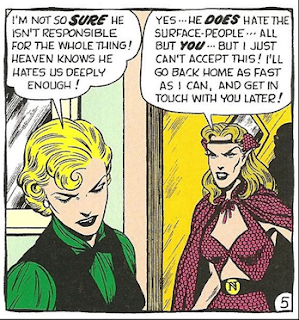 Everett drew these stories during the early 50’s, when he was married, had kids, and was doing very well financially, so for the most part, it makes sense to see a somewhat more heroic, conservative Namor who often acts as a government agent at the behest of his old love interest Betty Dean. 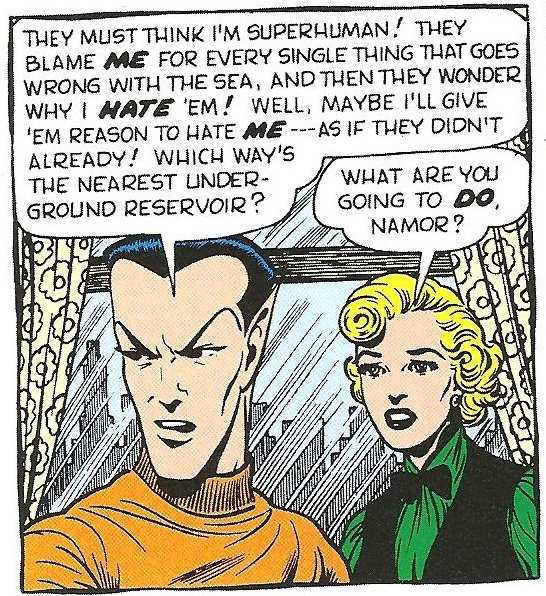 But every now and then, Namor will get mad about something, and it will be right back to war with the surface dwellers. It seems inconsistent, but it lets you see Everett’s mind-set. When Everett is happy, Namor will save kids whose yacht sunk and cooperate with police while receiving accolades from the public as if he’s freakin’ Superman. When Everett is pissed about something, Namor will contemplate stealing world-destroying weapons from the villains so he can wipe out the human race himself! Sometimes Namor will be perfectly friendly initially, but be falsely blamed by humans, join up with the villains, then turn his back on them at the last minute. 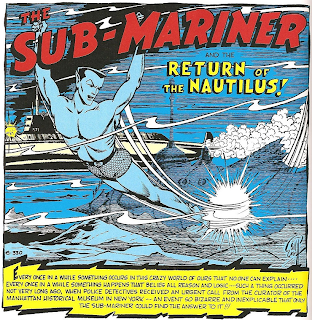 Him turning against the villains or giving up his plans of vengeance are not always motivated by some innate morality on his part either; in one story, all of Earth’s water is stolen by aliens, and when Namor gets abducted along with the water after being falsely blamed, he decides to let the aliens keep the water and let all of Earth die of thirst as revenge for blaming him! The only reason he lets Earth have its water back is because he realizes it will doom his own people. 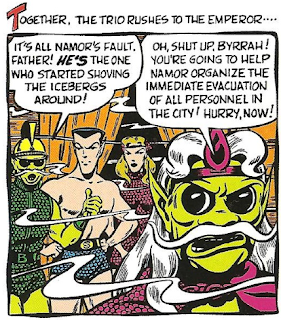 Namor returns the water, reluctantly saving the humans who still blame him, but at least back among his own race he is considered a hero, and welcomed back to his kingdom after being exiled earlier in another storyline. So…happy ending, I guess? 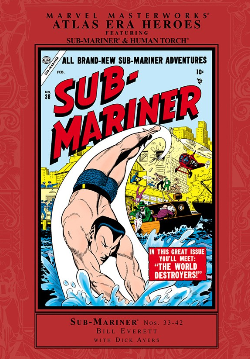 There’s a lot of talk about superheroes being modern-day equivalents of ancient gods, and you can definitely see that in these Sub-Mariner stories besides the obvious classical influences like the legends of Atlantis (Although here, Namor’s kingdom is set specifically in Antarctica). Just like the gods of Greece, Namor can be mankind’s friend in some stories, in others; he can be its worst enemy over something petty. 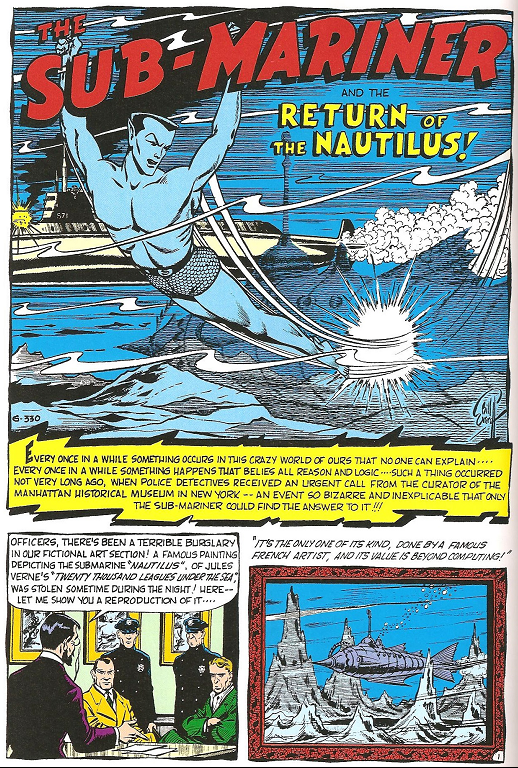 Everett may not have thought much of it, but he was doing something unique among superhero comics: Creating a character that the reader is fascinated by not so much because of the question of what others will do to him, but because of what he’ll do to others, and because watching Namor rage at the humans allows the reader (and his creator) to blow off some steam of their (his) own. It’s raw, somewhat juvenile, but in its own way, it’s just as powerful a form of self-expression as anything by Robert Crumb or Chris Ware (Or Fletcher Hanks...). Everett seemed aware that sometimes, kids just like seeing destruction and mayhem and aren’t always concerned with saving the world and helping out their neighbor. He tapped into the secret that makes anti-heroes like The Hulk and Wolverine popular. 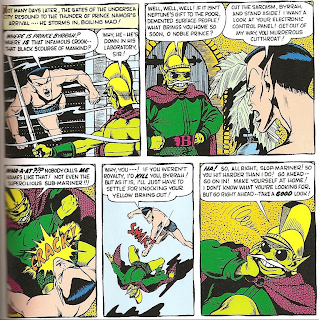 But he also doesn’t make humans out to be bad in order to make Namor look good, oftentimes some things are the result of simple misunderstandings on the humans part, and considering how temperamental Namor is, well, you don’t blame humans one bit for mistrusting him. 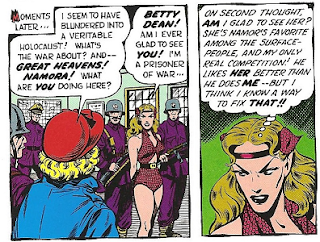 The character of Betty Dean, who always tries to be sympathetic to Namor but just can’t take it all the time, manages to be a good alternate viewpoint character for the reader when Namor starts to seem too unsympathetic. The Atlanteans (Yeah, I said they lived in Antarctica, but I’m calling them that anyway) are also shown to have their good points and bad points as well. 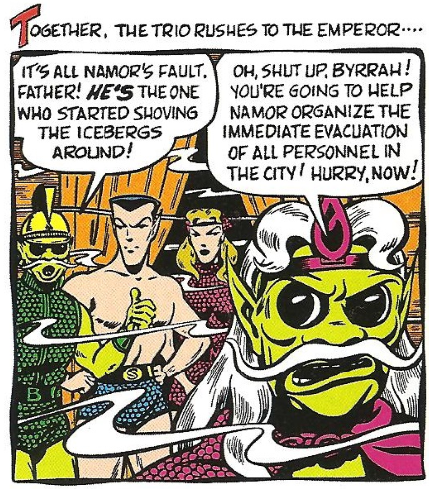 Prince Byrrah, the Emperor’s step-son, is a jealous, spoiled tyrant who has all of Namor’s bad qualities with none of his good ones, ever hungry for war and glory, and driven by a childhood jealousy over Namor. 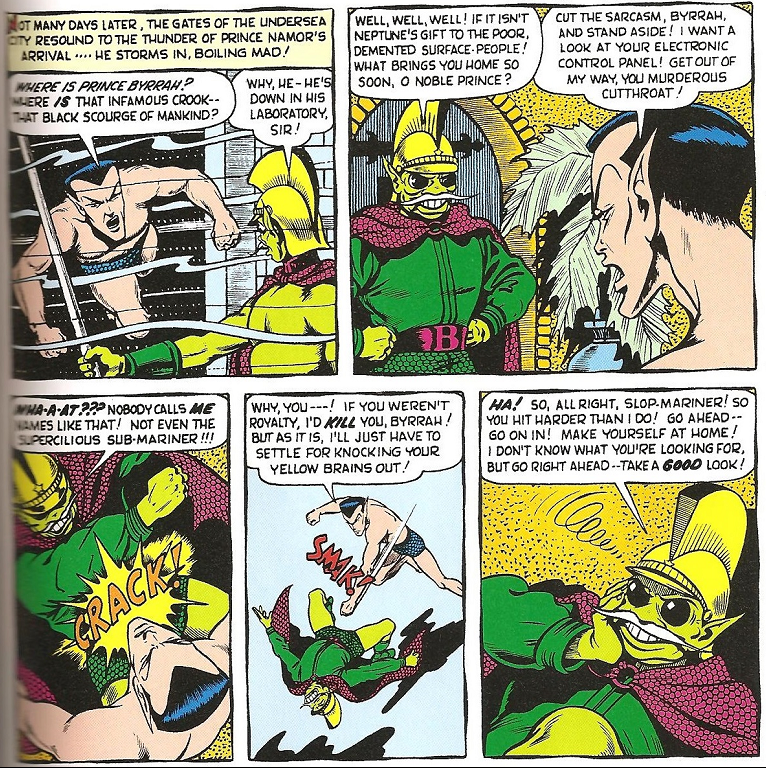 It’s a fascinating pre-cursor to the Thor/Loki rivalry, except that here, Byrrah plays the Thor figure, since he is shown to have more influence than Namor with the Emperor and is always addressed as ‘Prince”, with it being implied that Namor’s weirdness (His human-colored skin) has made him something of an outcast among his own people, since he is only addressed as “Prince” among the humans and in stories flashing back to Namor’s youth. Byrrah always plays the villain in these stories, but is always welcomed back by the time of the next story. A temperamental, unpredictable hero who isn’t always heroic and doesn’t always feel like he belongs, humans who unjustly (and sometimes perfectly justly) distrust the hero, villains with a connection to the hero on a personal level, subtexts of sibling rivalry, and multiple love interests with their own foibles. These were themes and ideas that were pretty much unseen in 50’s superhero comics, and in my opinion, elevate these stories above simply being outlets for Everett’s anger. More importantly however, they are all themes that would soon come to be commonplace at 60’s Marvel. Maybe Everett deserves much more credit for being one of Marvel’s architects than he’s been given. 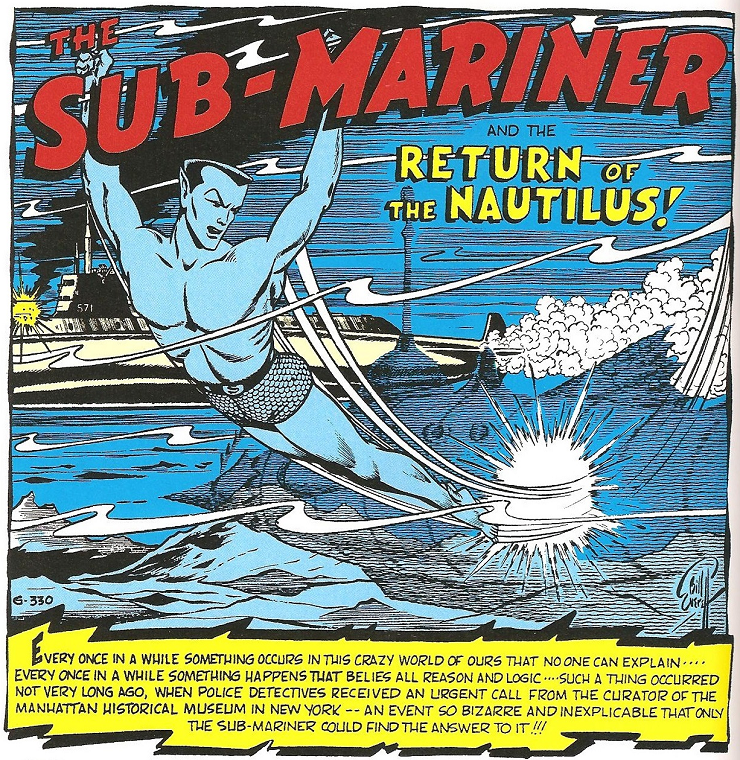 One thing I do have to say though; I seriously doubt these were things that would have cropped up in a 1950’s live action kiddie show starring Sub-Mariner, if they had ever really been serious about making one. Hey kids! 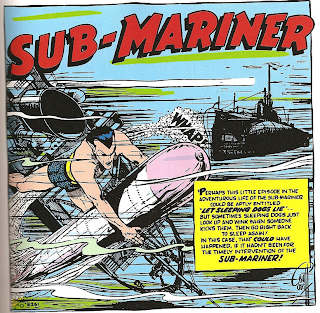 In this episode, Namor goes berserk and tries to exterminate the human race again! Same Sub-Time, same Sub-Channel! You never saw that kind of humor or creativity in Cap & the Torch’s contemporaneous stories. 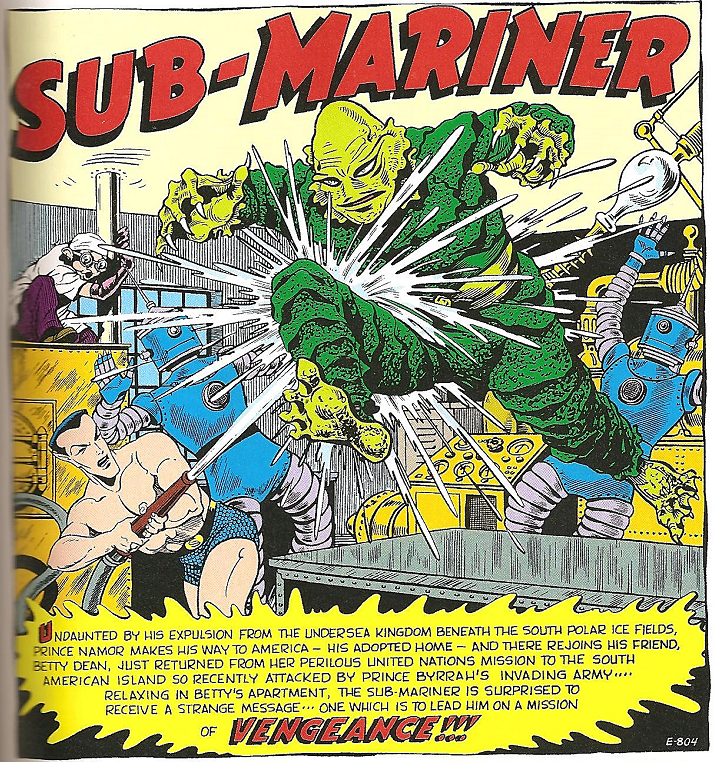 Besides just dealing with Byrrah and communist agents, Namor also gets entangled with some truly bizarre villains like an undead queen who can only live underwater and turns to a corpse when she surfaces, a mad scientist and his Creature from The Black Lagoon-esque monster, an evil hypnotist who keeps Namor under his control for months on end, a robot double, a giant crocodile (who isn’t really all that evil) and the ghost of Jules Verne’s Nautilus, brought to life by a magician from a stolen painting! I love how Everett draws the Nautilus to look like the one from the recent 1954 Disney film so that readers would recognize it, but also goes out of his way to mention that it was inspired by a book by a French author. That information alone was probably more useful to kids back then than the Classics Illustrated version! (Was there a Classics Illustrated version of 20’000 Leagues?) Marvel really needs to bring that story into continuity and tie it into Fantastic Four villain Painter of a Thousand Perils, even though we never really find out anything about the magician, his methods or motives. That’s what retcons are for, though. Towards the end of the volume, Namor settles back into being a straight-up superhero again, but since the crazy plots keep coming and the entertainment value never goes away, it doesn’t really matter. Sometimes it’s fun to see a superhero traditionally portrayed as an outlaw or a grim character treated as a normal hero for a time. That’s what made those Silver Age Spectre stories so fun to read last year. 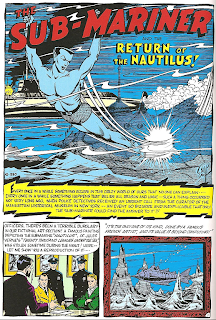 Everett also shows an interest in world-building that few other superhero comics writers at the time did, such as a series of stories about Namor’s youth, exploring how he first discovered his powers, and his rivalry with Byrrah. Some are actually kind of whimsical, like this one story where Namor befriends a Frost Giant whom only he can see. 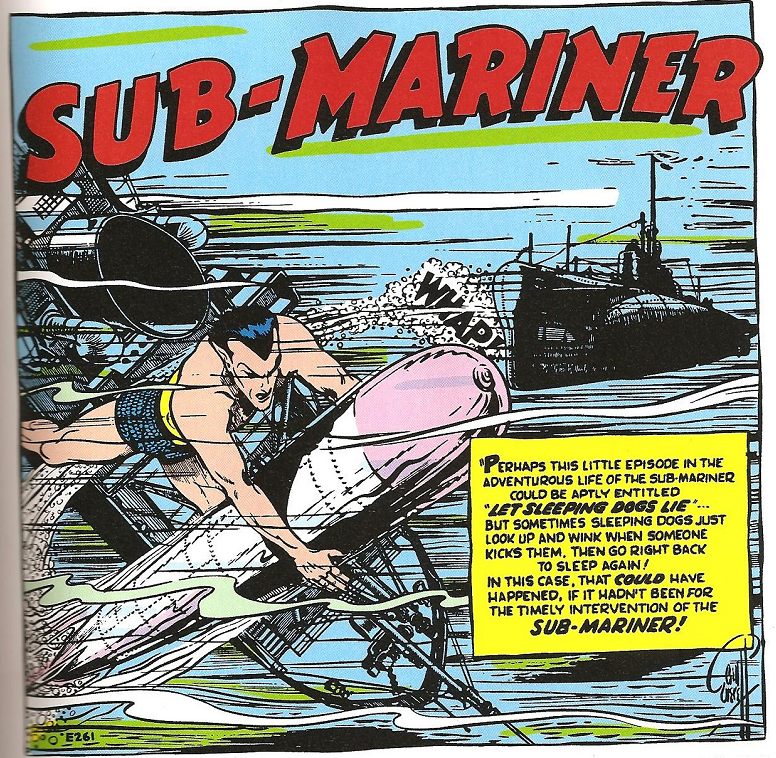 There are some minor non-Sub-Mariner backup features as well such as some pretty lousy Human Torch stories, and after that, very short stories themed around sea life, with titles like “Octopus!”, “Shark!” or “Swordfish!” that all revolve around the animal in question. These are fun, but nothing to write home about. The reproduction of these stories is pretty fantastic, and the linework looks just as good, in fact, better, than the 60’s reprints in comics like Fantasy Masterpieces and Marvel Super Heroes (Which is how I first discovered them). Some of the coloring is a little off (Namor’s shorts are always blue, when they usually varied from green to blue in the originals, and the skin-coloring of the Atlanteans is strange to say the least, with Princess Fen being given human-colored skin, which she was a few times in the originals, but mostly by accident), but nothing too upsetting. This is a fantastic volume and gets my highest recommendation. 5/5.